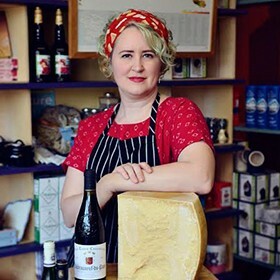 In 2016, I had the incredible good fortune of purchasing the The Cheese Lady’s flagship location in downtown Muskegon, taking over for the original Cheese Lady, Kathleen Fagan Riegler. Kathleen has left huge shoes to fill. Fortunately, I learned from the very best – Kathleen herself! Nearly a decade ago, I found myself back in Muskegon after four years in Ann Arbor. Having earned a taste for artisanal cheeses at a variety of Ann Arbor cheesemongers, I was overjoyed to discover Kathleen’s booth at the Muskegon Farmer’s Market. 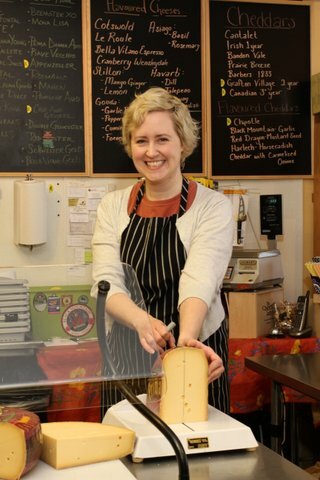 It wasn’t long before Kathleen opened up a small cheese shop storefront, and soon after I was there with my resumè to see if she could use some help. ‘I’m never going to be busy enough to need any help,’ I remember Kathleen saying, but just a few weeks later she was busy enough to hire me. Over these past nine years, I have had the privilege of watching Kathleen’s dream take root and blossom. The most important ingredient in that success (besides amazing cheese) has been her commitment to our customers, and that’s a tradition we continue to take great pride in. 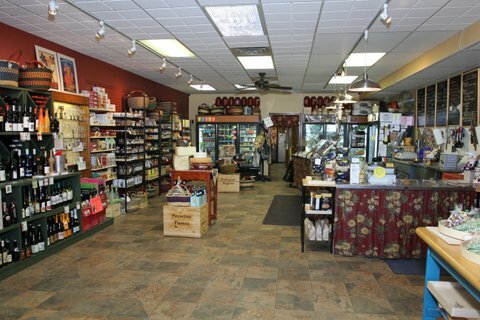 Finding outstanding cheese for extraordinary people is why we’re here! I also am extremely proud to be a permanent part of a revitalized downtown Muskegon. Together, this community is breathing life back into the heart of West Michigan’s best-kept secret. There are currently no events for this location. Please see the full events calendar for all locations for additional events. "Another Episode of Ships and Cheese. A double engine ship deserves a cheese that packs twice the punch, blue with peppers! Glacier Wildfire Blue from ..."
Use the form to send The Cheese Lady of Muskegon a message.